What is a Long Term Investment? I’ve encouraged you to identify your long term goals and match them with long term investments for as long as I’ve been writing Wealth Pilgrim. That’s the best way to diversify your assets possible. But what is a long term investment? I’ve never really broken it down. Let’s take care of that oversight right now. Before we can talk about long term investments, we should probably be clear on what “long term” means. But that is easier said than done. There is no hard and fast rule on this one because everyone’s situation is different. And as a result there are no cut and dry cutoff points. As you’ll see, it’s actually more of a turning point. Let me illustrate. Generally speaking, if your investment time frame is greater than 5 years, you can start to introduce more long term investments (which I’ll define shortly) into your portfolio mix. That’s because you can (theoretically) tolerate a little fluctuation in value with the belief that over the 5 years the good and bad periods will balance out to your benefit. One person might have a 60/40 mix of bonds and stocks for a 5 year hold period. Another person might be better off with 70/30. As I said, it just depends on your goals and how much risk you are willing to take over the short run. If you are investing for 7 to 10 years, you might put even more emphasis on long term investments and move 10% or 20% more out of bonds and into equities. When you want to put money aside for 10 years or more, think about long-term investments with the entire account. This might be true even if you are interested in earning income from your investments immediately. Once again, this depends on your personal situation, and what your goals and comfort levels are. Now that we have some agreement on the time frame, let’s get back to the original question.If you were a smarty pants, you might tell me that a long term investment is any investment you hold for the long term. While technically that is true, that definition isn’t very helpful. A long term investment is any investment that has a higher (historic) probability of maximizing your returns over a 10 year period as compared to competing alternatives. Let’s take this definition for a test drive and see if it works. Even though the last 10 years were very difficult for investors, you can see that equities were a far better place to be than the alternatives. And if you look back even further, the story is just as compelling. Keep in mind that stocks don’t always come out on top. If you compare the returns between 2000 and 2010 the outcome would be different. Bonds would have been a better place to be. 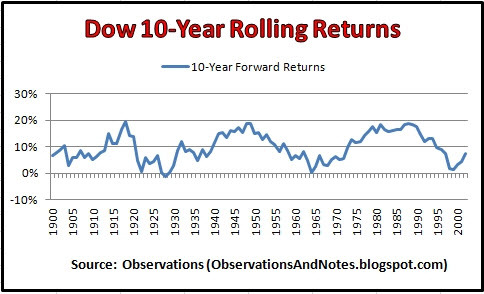 And there were other 10 year period where stock returns were very poor. The following chart tells the story pretty well. You can see that there were a number of 10 year periods where stocks did poorly. Remember, we’ve only considered stocks, bonds and cash in the example but real estate might be a very attractive long term alternative as well. When you invest for the long term, you are venturing into the unknown. All you can do is try to get the odds on your side. And if you want that edge, equities will probably give it to you. It doesn’t mean you are always going to make the right decision. It means you are making the best decision with the information you have at the time. How do you define long term? What are the best long term investments you’ve ever made?